Apples and almonds are a great combination and although I love this pairing (especially with a large wedge of Camembert on a cheeseboard) I thought something a little sweeter and with a stronger almond flavour would be a better choice of ingredient to hold its own in this apple dish. 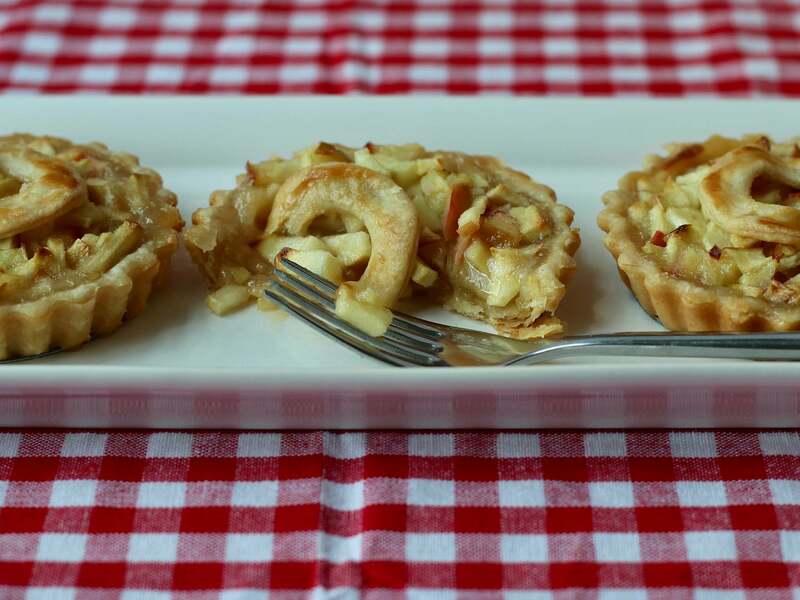 Just a thin layer of marzipan on the base of each tartlet was all that was needed to provide a sweet buttery contrast to the tart braeburn apples. You can buy your pastry if you like, but by the time you’ve unwrapped the packet and unfolded or rolled it out you could have made your own, it really is that quick and simple. However, if you decide to use shop-bought pastry (and there is no shame in that), get shortcrust, not all-butter puff pastry, because these tartlets will be rich enough without the addition of even more butter. The addition of amaretto is optional, but it gives the tartlets yet another layer of almond flavour. Alternatively, you could serve a small glass alongside the tartlet or add to strong black coffee and top off with some double cream for an amaretto liqueur coffee if serving at a dinner party. Sift the flour into a mixing bowl with the salt. Cut the butter into small pieces and add to the flour. Rub in with your fingertips (or use a food processor) until the mixture resembles fine breadcrumbs. Add ice cold water, a tablespoon at a time, and bring the pastry together with your fingers. Use your hands to squeeze the pastry together and turn out onto a floured work surface. Knead lightly until it forms a soft dough but don’t over work the dough as this will give the cooked pastry a hard texture. Flatten slightly then wrap in cling film and put into the fridge for 30 minutes to an hour to rest. Meanwhile, peel, core and roughly dice the apples then drop them into a bowl of water and the lemon juice to stop them browning. Melt the butter in the microwave and pour into a large mixing bowl with the sugar and amaretto (if using). Drain the apples and blot with kitchen paper to roughly dry them then tip into the bowl containing the butter and sugar mix. Mix well to make sure the apple slices are completely coated and put to one side. Using one of the loose bases as a template, cut out three disks of marzipan and put aside. Remember to put the base back in the tartlet case. Remove the pastry from the fridge, unwrap and place on a floured work surface. Cut into three and roll out each piece to about 3mm and large enough to line each case. Place over the tartlet cases and carefully ease in, being careful not to tear the pastry, then trim off any excess. Line each pastry case with a pre-cut disk of marzipan then divide the apple mixture between the cases. If you would like to decorate your tartlets, roll out the remaining pastry to a thickness of about 2mm and using a small sharp knife cut out your chosen shapes. Place on top of the apple mixture and brush with a little beaten egg. Bake for 30 minutes until the pastry is golden and the apple mixture is bubbling. Serve with a dollop of crème fraîche and a sprinkle of toasted almond flakes. Shrove Tuesday: What foods do people eat around the world to celebrate?